Sun., April 29, 2018, 5:51 p.m.
HOUSTON – James Harden proved once again that Utah’s vaunted defense was no match for him. Harden scored 41 points and the Houston Rockets raced out to a huge lead and sailed to a 110-96 win over the Jazz in Game 1 of the Western Conference semifinals on Sunday. Houston was up by 25 at halftime behind 34 points combined from Harden and Chris Paul. 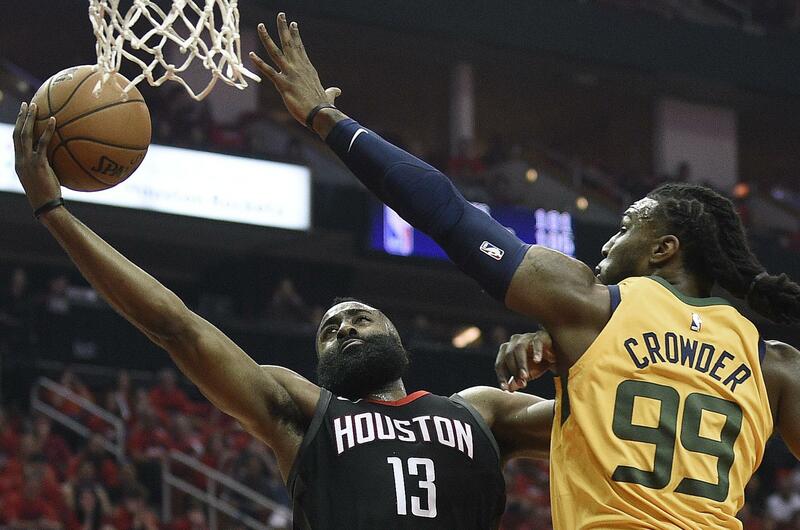 The Jazz, who didn’t wrap up their first-round series with Oklahoma City until late Friday night, looked sluggish and struggled to keep pace with the top-seeded Rockets, who hadn’t played since eliminating Minnesota on Wednesday. The Jazz tied for second in the NBA in the regular season by allowing just 99.8 points, but failed to stop Harden in any of their meetings. Harden, who also had seven assists and eight rebounds, picked up where he left off in the regular season against the Jazz when he averaged 34.3 points, led by a 56-point performance in a 137-110 win in November. Utah coach Quin Snyder seemed at a loss as to how to limit the MVP front-runner, who had the sixth 40-point playoff game of his career. It was Houston’s fourth straight win by 10 or more points this postseason, and the Rockets have won their five games against the Jazz by an average of 16.8 points. The Jazz got 21 points each from rookie Donovan Mitchell and Jae Crowder while playing without starting point guard Ricky Rubio, who sat with a strained left hamstring. It was a significant blow after he averaged 14 points, 7.3 rebounds and seven assists in the first round. The Jazz refused to blame their tough game on the fact that they didn’t have much of a break between the first and second round. The Rockets had 10 3-pointers by halftime, led by three apiece from Harden and P.J. Tucker. They finished with 17, including seven from Harden, which tied his career-high for a playoff game. The Rockets were up by 18 entering the fourth after Paul hit a 3-pointer at the end of the third. Utah scored the first seven points of the fourth quarter to get within 86-75, but Harden made three free throws over the next minute to end the run. Published: April 29, 2018, 5:51 p.m.